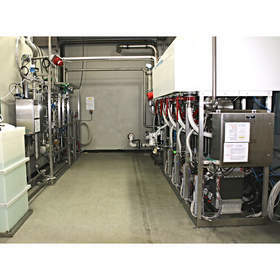 Proton OnSite Delivers Electrolyzer for First Power to Gas Project in the U.S.
WALLINGFORD, CT--(Marketwired - Apr 13, 2015) - Proton OnSite, the world leader in Proton Exchange Membrane (PEM) electrolyzer technology, will participate in the first power to gas (P2G) project in the United States. The project launch was announced earlier by Southern California Gas Company (SoCalGas), the largest natural gas utility in the United States. This will be the first demonstration of this energy storage system concept in the U.S., and will provide valuable data on the dynamics of electrolyzers in a renewable energy system. Fundamentally, the project will involve testing two Proton electrolyzers, nominally rated for 7 kW and 60 kW of input power respectively, as a means of generating hydrogen from a local Photo Voltaic source. The produced hydrogen will then be injected into a simulated natural gas pipeline system at the National Fuel Cell Research Center. Storing renewable electricity as hydrogen or in the gas network for energy utilization later in the day, week, or month allows for minimizing the demand ramp in the evening as well. Robert Friedland, Chief Executive Officer of Proton OnSite, said: "We are excited to work on this important demonstration and technology validation effort. Proton is proud to have been awarded, through a competitive process, the ability to demonstrate the reliability and responsiveness of our PEM electrolyzer technology. We are committed to the emerging hydrogen energy storage market, and honored to have been selected for the first P2G demonstration in the United States." To address large scale energy storage requirements, Proton has launched a new commercial megawatt (MW) scale electrolyzer platform, the M Series. At the 2 MW level, the new M Series provides a 13x increase in hydrogen production compared to other commercial PEM systems. In combination with greater production capacity, the M Series reduces the capital cost per kilogram of producing hydrogen by over 50%. The growth of renewable energy has created a need for large scale energy storage. The M Series addresses this by providing scalable cost effective conversion of excess, stranded or curtailed power to hydrogen, thereby creating a carbon-free solution for storing energy and providing grid balancing services. David Bow, Senior Vice President of Sales and Marketing, said: "The SoCalGas P2G project will provide important validation of the technical and economic feasibility of hydrogen energy storage at grid scale. The timing for the announcement coincides well with our press conference unveiling our M Series electrolyzers today at 12:00 at the Group Exhibit 'Hydrogen + Fuel Cell + Batteries' of the Hannover Messe Trade Fair." Additional support from the National Renewable Energy Laboratory and Xcel Energy also made this project possible.